28 After he had said this, he proceeded on his journey up to Jerusalem. 29 As he drew near to Bethphage and Bethany at the place called the Mount of Olives, he sent two of his disciples. 30 He said, "Go into the village opposite you, and as you enter it you will find a colt tethered on which no one has ever sat. Untie it and bring it here. 31 And if anyone should ask you, 'Why are you untying it?' you will answer, 'The Master has need of it.'" 32 So those who had been sent went off and found everything just as he had told them. 33 And as they were untying the colt, its owners said to them, "Why are you untying this colt?" 34 They answered, "The Master has need of it." 35 So they brought it to Jesus, threw their cloaks over the colt, and helped Jesus to mount. 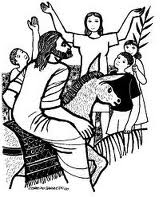 36 As he rode along, the people were spreading their cloaks on the road;37 and now as he was approaching the slope of the Mount of Olives, the whole multitude of his disciples began to praise God aloud with joy for all the mighty deeds they had seen. 38 They proclaimed: "Blessed is the king who comes in the name of the Lord. Peace in heaven and glory in the highest." 39 Some of the Pharisees in the crowd said to him, "Teacher, rebuke your disciples." 40 He said in reply, "I tell you, if they keep silent, the stones will cry out!" a. Lấy áo choàng trải trên đường. b. Lớn tiếng ca tụng Thiên Chúa. c. Im lặng lắng nghe lời Thiên Chúa. a. Vinh danh Thiên Chúa trên trời. b. Chúc tụng Đức Vua, Đấng ngự đến nhân danh Chúa. c. Lạy Đức Vua, xin cứu vớt chúng tôi. d. Hoan hô Đức Vua chiến thắng. c. Quân lính La mã. “Chúc tụng Đức Vua, Đấng ngự đến nhân danh Chúa!